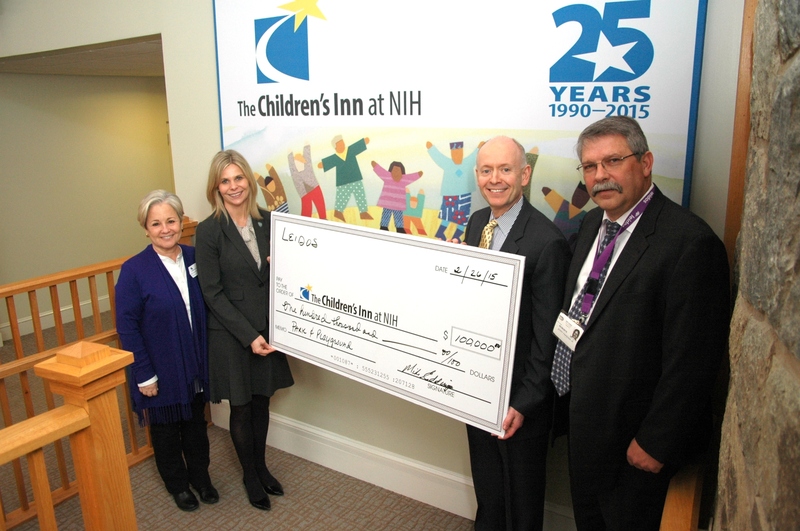 The Children’s Inn at NIH announces a $100,000 donation from Leidos, a Reston, Virginia-based health, national security, and engineering solutions company. This gift marks a pledge of continued funding from Leidos— more than $625,000 since 2011—for The Inn’s Park and Playground, as well as other sponsorships and ongoing volunteer support from Leidos employees. The Children’s Inn at NIH is a nonprofit, residential “place like home” for more than 1,500 seriously ill children and their families annually. Children come from across the country and around the world to stay together with their parents and siblings, free-of-charge while they are being treated at the NIH Clinical Center, the world’s leading biomedical research center. Leidos employees contribute to special projects, such as their active involvement with the construction of The Inn’s Park and Playground, which opened in 2013. The Park and Playground offers children of all ages a place to relax and recharge after medical treatments. A few of the park’s features were created after receiving design tips from the children. In addition, Leidos provided 25 gift cards to families staying at The Inn during the holidays, served dinner to Inn families, and sent a team of volunteers to help install new mattresses and box springs in The Inn’s 59 rooms. For more information about The Children’s Inn, including volunteer opportunities or other ways to support Inn families, visit childrensinn.org. The Children’s Inn at NIH is a residential “place like home” for seriously ill children and their families while they are participating in groundbreaking medical research at the National Institutes of Health, the world’s leading biomedical research center. Families come from across the country and around the world to stay together at The Inn – free of charge – no matter how long they need to stay. The Inn gives kids a chance to be kids and aims to reduce the burdens of illness through recreational, therapeutic and educational programming. Leidos is a FORTUNE 500® science and technology solutions leader working to address some of the world’s toughest challenges in national security, health and engineering. The Company’s 20,000 employees support vital missions for our government and the commercial sector, develop innovative solutions to drive better outcomes and defend our Nation’s digital and physical infrastructure from ‘new world’ threats. Headquartered in Reston, Virginia, Leidos reported annual revenues of approximately $5.77 billion for its fiscal year ended January 31, 2014 after giving effect to the spin-off of the company’s technical services and information technology business. For more information, visit www.Leidos.com.